MUMBAI: The Global Indian Music Academy (GiMA) honoured the most deserving music artistes in both, film and non film categories at the GiMA Awards, which were held on 24 February at Film City, Mumbai. The biggest winner of the night was Amit Trivedi for the film ‘Queen’. The singer/ composer won for Best Music Director, Best Film Song (London Tumakhda from Queen) and Best Music Arranger with Sourav Roy, also for 'Queen'. AR Rahman’s won two awards, one each in film and non film categories. He took home the award for Best Film Album for ‘Highway’ and Best Fusion Album for ‘Coke Studio at MTV Season 3’ in non film. The Best Music Debut award in both, film and non film categories went to Armaan Malik. In the film category, Arijit Singh took home two awards, one for Best Playback Singer Male for the track ‘Muskrane’ from ‘Citylights’ and for Best Duet for the track ‘Samjhavan’, with Shreya Ghoshal. Kanika Kapoor received Best Playback Singer Female for ‘Baby Doll’ (Ragini MMS2). Divya Kumar won Best Upcoming Singer, and Shraddha Kapoor was awarded Best Celebrity Singer of the Year. Yo Yo Honey Singh's 'Sunny Sunny' from the film 'Yaariyan' was given the Most Streamed Song award for 2014, a category that was added this year after GiMA partnered with Hungama. Music composer Anandji Virji Shah was honoured with the Lifetime Achievement Award for his contribution to music. In the non-film music category, Zakir Hussain was bestowed with the Global Musician Award. He also won Best Ghazal Album for ‘Hazir 2’, with Hariharan. ‘Haider’ won two awards- one for Best Lyricist for the track ‘Bismil’ by Gulzar and for Best Background Score by Vishal Bhardwaj. Best Pop Album went to Papon featuring Various Artistes for the ‘Coke Studio at MTV Season 3’ album. Best Electronic Dance Track award was given to The Midival Punditz and Kutle Khan for the track ‘Twilight’. Best Hindustani Classical Album- Instrumental was awarded to Niladri Kumar. Daler Mehndi took home the Wizcraft Honour for Best Live Performer, and a special award for Best Music Initiative was awarded to the Red Bull Tour Bus. The Mihir Joshi Band received the Best Rock Album award for ‘Mumbai Blues’. The award for Best Folk Album was given to The Raghu Dixit Project for the album ‘Jag Changa’. Best Devotional Album was awarded to Shankar Mahadevan for ‘My Devotional Favourites’. The evening saw the debut performance of AR Rahman’s newly formed band- NAFS. Speaking on the occasion, the maestro said, “For me to give a platform to the next generation is my mission and this is one of the first initiatives to represent India internationally. The inspiration behind was Stevie Wonder. 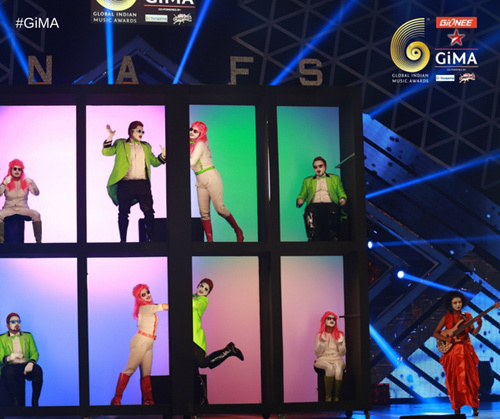 It has been my privilege to showcase NAFS at GiMA for the first time ever.” There were also performances by Ankit Tiwari, Arijit Singh and others. The performance by ‘The S7- Super 7’ was another highlight and comprised singers who have had hits in the past year including, Armaan Malik Shadab Faridi, Md Irfan and Hriday Gattani. A number of big names from the film and music industry were seen at the event including, Shahid Kapoor, Shraddha Kapoor, Anil Kapoor, Shaan, AR Rahman, Hariharan, Shankar Mahadevan, Bhushan Kumar, Armaan Malik, Manish Paul, Aditi Rao Hydari, drummer Shivamani, Neha Kakkar, Ankit Tiwari, Sonu Nigam, Mihir Joshi, Arjan Bajwa, Arijit Singh, Hard Kaur, Urvashi Rautela, Raghu Dixit and others.